(1) S'rî S'uka said: 'From Khathvânga there was Dîrghabâhu, from him the renown and dexterous Raghu was born, from whose son Aja the great king Das'aratha was born. (2) Upon the prayers of the God-conscious ones the Absolute Truth took birth from his loins in four forms: the Supreme Lord in person along with three of His expansions. They appearing as four sons were known as Râma, Lakshmana, Bharata and S'atrughna. (3) Oh King, you heard again and again the descriptions by many seers and knowers of the truth of His transcendental exploits as the husband of Sîtâ [*, compare B.G. 4: 34]. (4-5) Obedient to His father He left the kingdom behind and wandered together with His beloved [Sîtâ] from forest to forest on His two lotus feet that were as tender as the palm of a hand. This He did in the company of Hanumân and Lakshmana who took away the pain of His path. He was separated from His sweetheart Sîtâ [by Râvana] because He had disfigured S'ûrpanakhâ [the sister of Râvana]. Over the ocean, that was afraid of His eyebrows He raised in anger, a bridge was built [to Lankâ, the residence of Râvana], after which He, the king of Ayodhyâ, like a forest fire destroyed the envious ones. May the mercy be upon us of Him who in sage Vis'vâmitra's arena of sacrifice, in the presence of Lakshmana, killed the great chiefs of the Râkshasas, the wanderers of the dark that were headed by Mârîca. (6-7) It was He who, among all the heroes in the world who were gathered in the hall where Sîtâ would select her husband, took up the mighty bow of S'iva that had to be carried by three hundred men. Fastening the string, oh King, and bending it, He broke the bow in two the way a baby elephant breaks a stick of sugarcane. By that victory he won the divine girl named Sîtâ who with her qualities, behavior, age and limbs was a perfect match for Him, she the Goddess of Fortune who had acquired a position on His chest. On His way home with her, He met and defeated, the deep-rooted pride of Bhrigupati [Paras'urâma] who three times [seven, thus twenty one times] had rid the earth of the seed of the [burden of unrighteous] rulers [see 9.16]. (8) Bowing His head to the command of His father, who in his attachment had made a promise to his wife that He had to abandon the kingdom, residence, opulence, relatives and friends, He with his wife left to live in the forest like a liberated soul [**]. (9) Living there He, as He wandered around, met with great difficulties. He maimed the body of the Râkshasa's sister [Râvana] because she had a [by lust] spoiled mind and then, with His invincible bow and arrows in His hands, had to kill the fourteen-thousand of her many friends headed by Khara, Tris'ira and Dûshana. (16) After the Master of the Raghu dynasty with all sorts of mountain peaks complete with trees and plants, that were transported by hand by the mighty monkeys, had constructed a bridge in the ocean [***], He, helped by the directions of Vibhîshana [a virtuous brother of Râvana], together with the soldiers led by Sugrîva, Nîla and Hanumân set foot on [the island of] Lankâ that just before had been set afire [by Hanumân's tail]. (17) There the houses of pleasure, granaries, treasuries, palace doors and city gates, assembly houses, turrets and [even the] pigeon houses were taken by force and dismantled by the Vânara [monkey] leaders who, just like an elephant herd, turned the squares and crossroads with all their flags and golden water pots on the rooftops, into one swirling river. (18) When the master of the Râkshasas saw that, he summoned Nikumbha, Kumbha, Dhûmrâksha, Durmukha, Surântaka, Narântaka and others to fight, and also called for his son Indrajit, his followers Prahasta, Atikâya, Vikampana and finally for Kumbhakarna [his mighty brother, see 4.1: 37, 7.1: 44 and 7.10: 36]. (19) All the Râkshasa soldiers with their hard to defeat swords, lances, bows, barbed missiles and spears, firebrands, javelins and scimitars [a curved sword], lined up in front of Him who was surrounded by Sugrîva, Lakshmana, Hanumân, Gandhamâda, Nîla, Angada, Riksha, Panasa and others. (29) S'rî S'uka said: 'Vibhîshana with the approval of the King of Kosala [Râma] performed for the family the funeral rites that for a deceased one have to be observed in order to save him from hell. (30) The Supreme Lord thereupon found His sweetheart [Sîtâ] back in an as'oka forest sitting in a small cottage at the foot of a s'ims'apâ [as'oka] tree. Sick from being separated from Him she was emaciated. (31) Râma seeing the poor plight of His sweetheart was filled with compassion. When she saw her beloved, her lotus-like mouth was overwhelmed with a great joy. (32) The Supreme Lord put Vibhîshana in charge of the rule over Lankâ's Râkshasas for the duration of a kalpa. He placed Sîtâ on His vehicle and then ascended Himself together with Hanumân and the brothers [Lakshmana and Sugrîva the commander] to return to His home town [Ayodhyâ] and conclude the period of the vow [that He would stay away for fourteen years]. (33) To celebrate His uncommon activities He on His way was showered with a choice of fragrant flowers offered by the higher class and was joyfully praised by the seer of the Absolute Truth [Brahmâ] and the ones belonging to him. (34) Lord Râmacandra, the One of Great Compassion, was very sorry to hear that His brother Bharata was lying down on a kus'a mat, had matted locks, ate barley cooked in cow's urine and had covered Himself with tree bark. (35-38) Bharata hearing about His arrival took the two sandals on His head [that Râma had left behind on the throne to represent Him] and came, accompanied by all citizens, the ministers and the priests, to welcome His eldest brother. Departing from His camp Nandigrâma He was accompanied by songs, the sounds of musical instruments, the constant recitation of mantras performed by brahmins, by gold embroidered flags on golden chariots that were pulled by the most beautiful, with gold caparisoned horses and by soldiers in gold covered armor. Approaching in procession with nicely dressed courtesans and servants as also with soldiers on foot and everything else that would befit a royal reception, like the wealth of all kinds of jewelry, He fell down at the lotus feet with an ecstatic love that softened the core of His [ascetic] heart and filled His eyes with tears. (39-40) Placing the two slippers before His brother, He stood with folded hands and tears in His eyes. Then He was embraced by Râma who, bathing Him with the water from His eyes, held Him in His arms for a long time. Râma, Lakshmana and Sîtâ together offered the scholars and the others worthy of worship personally their obeisances and also received these in return from all the citizens. (41) Seeing their Lord returning after so many years the citizens of Kosala waved with their upper garments, offered Him garlands and began to dance in great jubilation. (42-43) The sandals were carried by Bharata, the whisk and luxurious fan were carried by Vibhîshana and Sugrîva, a white parasol was carried by the son of the wind god [Hanumân] and the bow and two quivers were carried by S'atrughna. Sîtâ held the waterpot with water from the holy places, Angada held the sword made of gold and the King of the Rikshas [Jâmbavân, the leader of the bears who also participated in the war] held the shield, oh King. (44) Sitting on Kuvera's heavenly chariot [the 'Pushpaka' captured from Râvana] He, the Supreme Lord devotedly being worshiped by the women and the reciters, oh King, appeared as brilliant as the moon risen among the planets. (45-46) After properly being welcomed by His brother He was festively received in the city of Ayodhyâ. Upon entering the royal palace He paid mother Kaikeyî, His other stepmothers and His own mother [Kaus'alyâ] His respects. The spiritual teachers, friends of their age and the youngsters were all of worship and their welcome was returned befittingly by Râma, the princess of the Videhas [Sîtâ] and Lakshmana. (47) The mothers reviving like bodies awakening from sleep, while keeping their sons on their lap, wetted them with a continuous flow of tears in letting go of their grief [over having been separated for so long]. (48) According to the vidhi the matted locks were shaven off by the family priest [Vashishthha] and the elders of the family, after which, with the water of the four oceans and other paraphernalia, a bathing ceremony was performed like it was done for King Indra [see 6: 13]. (49) Thus having been fully bathed, nicely dressed, decorated and garlanded, He shone brightly with His brothers and His wife. (50) Pleased with the surrender [of His brother] He accepted the throne offered to Him, as also the citizens who, serving according to their nature with their status orientations [varnâs'rama identity, see B.G. 4: 13], all deserved His protection for that quality. Râma was therein just like a father and was by them therefore also accepted as their father. Third revised edition, loaded January 9, 2013. S'rî S'uka said: 'From Khathvânga there was Dîrghabâhu, from him the renown and dexterous Raghu was born, from whose son Aja the great king Das'aratha was born. Upon the prayers of the God-conscious ones the Absolute Truth took birth from his loins in four forms: the Supreme Lord in person along with three of His expansions. They appearing as four sons were known as Râma, Lakshmana, Bharata and S'atrughna. Oh King, you heard again and again the descriptions by many seers and knowers of the truth of His transcendental exploits as the husband of Sîtâ [compare B.G. 4: 34]. Obedient to His father He left the kingdom behind and wandered together with His beloved [Sîtâ] from forest to forest on His two lotus feet that were as tender as the palm of a hand. This He did in the company of Hanumân and Lakshmana who took away the pain of His path. He was separated from His sweetheart Sîtâ [by Râvana] because He had disfigured S'ûrpanakhâ [the sister of Râvana]. Over the ocean, that was afraid of His eyebrows He raised in anger, a bridge was built [to Lankâ, the residence of Râvana], after which He, the king of Ayodhyâ, like a forest fire destroyed the envious ones. May the mercy be upon us of Him who in sage Vis'vâmitra's arena of sacrifice, in the presence of Lakshmana, killed the great chiefs of the Râkshasas, the wanderers of the dark that were headed by Mârîca. It was He who, among all the heroes in the world who were gathered in the hall where Sîtâ would select her husband, took up the mighty bow of S'iva that had to be carried by three hundred men. Fastening the string, oh King, and bending it, He broke the bow in two the way a baby elephant breaks a stick of sugarcane. By that victory he won the divine girl named Sîtâ who with her qualities, behavior, age and limbs was a perfect match for Him, she the Goddess of Fortune who had acquired a position on His chest. On His way home with her, He met and defeated, the deep-rooted pride of Bhrigupati [Paras'urâma] who three times [seven, thus twenty one times] had rid the earth of the seed of the [burden of unrighteous] rulers [see 9.16]. Bowing His head to the command of His father, who in his attachment had made a promise to his wife that He had to abandon the kingdom, residence, opulence, relatives and friends, He with his wife left to live in the forest like a liberated soul [**]. Living there He, as He wandered around, met with great difficulties. He maimed the body of the Râkshasa's sister [Râvana] because she had a [by lust] spoiled mind and then, with His invincible bow and arrows in His hands, had to kill the fourteen-thousand of her many friends headed by Khara, Tris'ira and Dûshana. Oh king, when the ten-headed Râvana heard the stories about Sîtâ, it stirred his heart and made him lust to see her. [The demon] Mârîca then lured Râma away from their stay in the form of a golden deer that was killed by Him with a sharp arrow just as S'iva killed Daksha [with an ax, see 4.5: 22]. While He and His brother were in the forest, the unprotected daughter of the king of Videha [or Janaka] was kidnapped by the most wicked Râkshasa, like he was a tiger. Râma then wandering around like a man who, attracted to women, is in distress over being separated from his wife, thus gave an example [in this s'ringâra rasa] of where attachment all leads to. After having performed the funeral rites for him who had died for His sake [the eagle Jathâyu], He killed Kabandha [a headless monster] and became friends with the leaders of the monkey hordes so that He, informed by them about Sîtâ, could deliver her. He whose feet are worshiped by Brahmâ and S'iva, but appeared as a normal man, next killed Vâli [a wicked brother of Sugrîva]. Then He, accompanied by the monkey soldiers, proceeded to the shore of the ocean. 'We, the dull-minded, are truly not capable, oh Supreme One, to know You as the one Original Person and Supreme Master of all Universes who resides in the core of the heart. For the God-conscious ones are the result of Your goodness, the controllers of the people have resulted from Your passion, while the rulers of the material elements sprang from Your mode of ignorance. But You oh Lord, are the Master over all these modes. 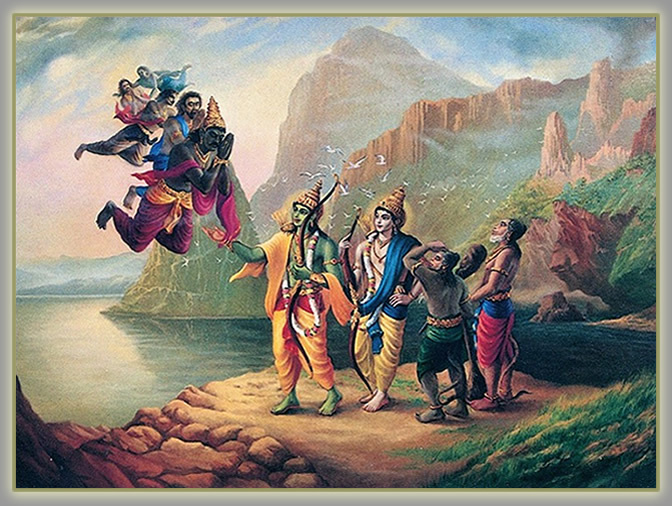 After the Master of the Raghu dynasty with all sorts of mountain peaks complete with trees and plants, that were transported by hand by the mighty monkeys, had constructed a bridge in the ocean [***], He, helped by the directions of Vibhîshana [a virtuous brother of Râvana], together with the soldiers led by Sugrîva, Nîla and Hanumân set foot on [the island of] Lankâ that just before had been set afire [by Hanumân's tail]. There the houses of pleasure, granaries, treasuries, palace doors and city gates, assembly houses, turrets and [even the] pigeon houses were taken by force and dismantled by the Vânara [monkey] leaders who, just like an elephant herd, turned the squares and crossroads with all their flags and golden water pots on the rooftops, into one swirling river. When the master of the Râkshasas saw that, he summoned Nikumbha, Kumbha, Dhûmrâksha, Durmukha, Surântaka, Narântaka and others to fight, and also called for his son Indrajit, his followers Prahasta, Atikâya, Vikampana and finally for Kumbhakarna [his mighty brother, see 4.1: 37, 7.1: 44 and 7.10: 36]. All the Râkshasa soldiers with their hard to defeat swords, lances, bows, barbed missiles and spears, firebrands, javelins and scimitars [a curved sword], lined up in front of Him who was surrounded by Sugrîva, Lakshmana, Hanumân, Gandhamâda, Nîla, Angada, Riksha, Panasa and others. The commanders of the soldiers of the Ruler of the Raghu dynasty [Râma], together hurried forward to fight the enemy followers of Râvana moving on foot and seated on elephants, chariots and horses who, condemned by the anger of mother Sîtâ, were out of luck in the battle. With trees, mountain peaks, clubs and arrows they were all killed by the [monkey] warriors lead by Angada and others. The Râkshasa leader seeing that his forces were defeated, thereupon fuming with anger drove his vehicle towards the brilliantly radiating Râma who, seated on the shining chariot of Indra that Mâtali [the driver] had brought, struck him with the sharpest arrows. Thus rebuking him He released the arrow He had fixed on His bow and that arrow pierced his heart like a thunderbolt. Vomiting blood from his ten mouths he fell down from his heavenly vehicle. His men then roared: 'Alas, what has happened to us? ', just like pious people do when they fall down [see also B.G. 9: 21]. Thereafter the many thousands of wives of the demons, headed by Mandodarî [Râvana's wife], came out of Lankâ and lamented upon approaching [their dead husbands]. 'Oh alas, now he has been killed who has protected us all! Oh Râvana, cause of our cries, to whom must the state of Lankâ bereft of your good self turn for shelter, now it is defeated by the enemy? Oh greatest patron, under the spell of lusty desires you, not knowing the influence of mother Sîtâ, have arrived at a situation like this. S'rî S'uka said: 'Vibhîshana with the approval of the King of Kosala [Râma] performed for the family the funeral rites that for a deceased one have to be observed in order to save him from hell. The Supreme Lord thereupon found His sweetheart [Sîtâ] back in an as'oka forest sitting in a small cottage at the foot of a s'ims'apâ [as'oka] tree. Sick from being separated from Him she was emaciated. Râma seeing the poor plight of His sweetheart was filled with compassion. When she saw her beloved, her lotus-like mouth was overwhelmed with a great joy. The Supreme Lord put Vibhîshana in charge of the rule over Lankâ's Râkshasas for the duration of a kalpa. He placed Sîtâ on His vehicle and then ascended Himself together with Hanumân and the brothers [Lakshmana and Sugrîva the commander] to return to His home town [Ayodhyâ] and conclude the period of the vow [that He would stay away for fourteen years]. To celebrate His uncommon activities He on His way was showered with a choice of fragrant flowers offered by the higher class and was joyfully praised by the seer of the Absolute Truth [Brahmâ] and the ones belonging to him. Lord Râmacandra, the One of Great Compassion, was very sorry to hear that His brother Bharata was lying down on a kus'a mat, had matted locks, ate barley cooked in cow's urine and had covered Himself with tree bark. Bharata hearing about His arrival took the two sandals on His head [that Râma had left behind on the throne to represent Him] and came, accompanied by all citizens, the ministers and the priests, to welcome His eldest brother. Departing from His camp Nandigrâma He was accompanied by songs, the sounds of musical instruments, the constant recitation of mantras performed by brahmins, by gold embroidered flags on golden chariots that were pulled by the most beautiful, with gold caparisoned horses and by soldiers in gold covered armor. [Approaching] in procession with nicely dressed courtesans and servants as also with soldiers on foot and everything else that would befit a royal reception, like the wealth of all kinds of jewelry, He fell down at the lotus feet with an ecstatic love that softened the core of His [ascetic] heart and filled His eyes with tears. Placing the two slippers before His brother, He stood with folded hands and tears in His eyes. Then He was embraced by Râma who, bathing Him with the water from His eyes, held Him in His arms for a long time. Râma, Lakshmana and Sîtâ together offered the scholars and the others worthy of worship personally their obeisances and also received these in return from all the citizens. Seeing their Lord returning after so many years the citizens of Kosala waved with their upper garments, offered Him garlands and began to dance in great jubilation. The sandals were carried by Bharata, the whisk and luxurious fan were carried by Vibhîshana and Sugrîva, a white parasol was carried by the son of the wind god [Hanumân] and the bow and two quivers were carried by S'atrughna. Sîtâ held the waterpot with water from the holy places, Angada held the sword made of gold and the King of the Rikshas [Jâmbavân, the leader of the bears who also participated in the war] held the shield, oh King. Sitting on Kuvera's heavenly chariot [the 'Pushpaka' captured from Râvana] He, the Supreme Lord devotedly being worshiped by the women and the reciters, oh King, appeared as brilliant as the moon risen among the planets. 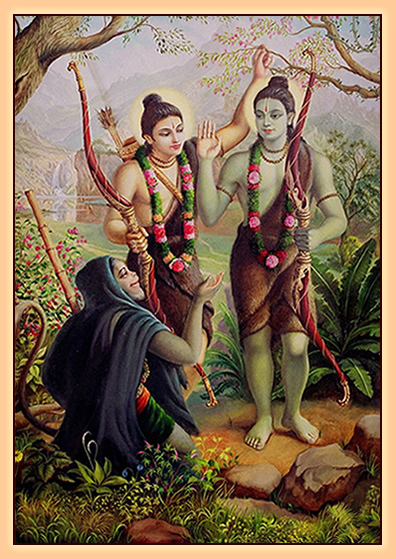 After properly being welcomed by His brother He was festively received in the city of Ayodhyâ. Upon entering the royal palace He paid mother Kaikeyî, His other stepmothers and His own mother [Kaus'alyâ] His respects. 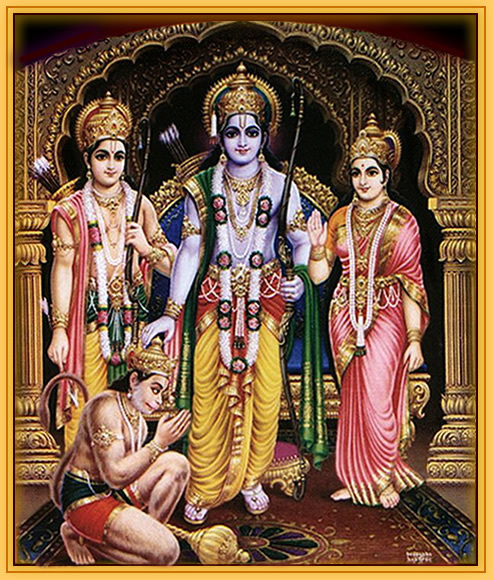 The spiritual teachers, friends of their age and the youngsters were all of worship and their welcome was returned befittingly by Râma, the princess of the Videhas [Sîtâ] and Lakshmana. The mothers reviving like bodies awakening from sleep, while keeping their sons on their lap, wetted them with a continuous flow of tears in letting go of their grief [over having been separated for so long]. According to the vidhi the matted locks were shaven off by the family priest [Vashishthha] and the elders of the family, after which, with the water of the four oceans and other paraphernalia, a bathing ceremony was performed like it was done for King Indra [see 6: 13]. Thus having been fully bathed, nicely dressed, decorated and garlanded, He shone brightly with His brothers and His wife. Pleased with the surrender [of His brother] He accepted the throne offered to Him, as also the citizens who, serving according to their nature with their status orientations [varnâs'rama identity, see B.G. 4: 13], all deserved His protection for that quality. Râma was therein just like a father and was by them therefore also accepted as their father. Although this all happened in Tretâ-yuga, the period became like Satya-Yuga because of Râma's presence as the ruling king who with His full respect of dharma made all living beings happy [see also 12.3: 15]. The forests, the rivers, the hills and the mountains, the lands, the islands, the oceans and the seas offered all the living beings all they could wish for, oh best of the Bharatas. During the period that Râma, the Lord in the Beyond, was king, there was no suffering [due to oneself, others and nature], no disease, old age, bereavement, distress, lamentation, fear and exhaustion or dying against one's will. Having sworn that He would not take another woman [for reasons of principle He separated from Sîtâ, see next chapter] He, as a saintly king pure in His character and dharma, by His personal dutifulness was an example, [in particular] for the householders. *: This and the next chapter are a summary of Vâlmîki's Râmâyana, the original scripture describing the st0ry of Râma. 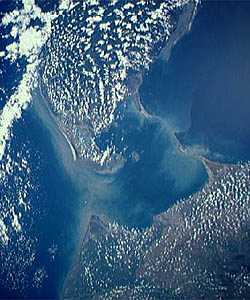 ***: This bridge is today still present in the form of a narrow passage of land close to the surface of the ocean between Lanka and India. It is called the Adam's Bridge and consists of a chain of shoals, c.18 miles (30 km) long [see picture and article]. The first painting on this page shows the meeting of Râma and Lakshmana in the forest with Hanumân. The second painting shows the meeting between Râma and Vibhis'ana. Both are © of Vrindavan das. Used with permission.